This weekend I had the pleasure of going to a renewal of the vows service (they called it a celebration of marriage). 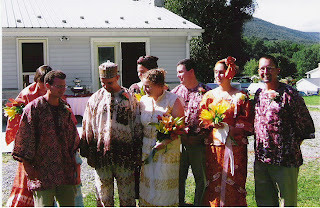 One of my best friends had been married in Nigeria and none of us in the United States were able to be there. Samantha and I went over later but not for the actual wedding. Brandy had always wanted to do fall colors. We had it in Brandy's parents backyard. The service was beautiful and informal. The wedding party include friends from school (college and high school) and Paul's brother. 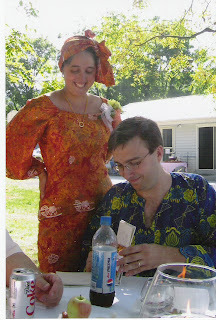 We were in Nigerian dress. I don't have a picture of it but we traveled from the parking area to the house via a Model T car. Paul's father is the antique car guy and his brother too. 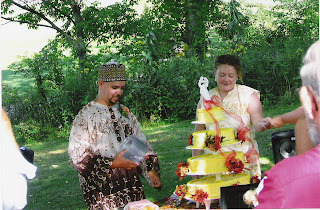 Brandy's cake was made by Linda our pastor's wife she made my cake and Sam's. Brandy and Paul did a great job visiting with everybody. Now I did say picnic. Sunday evening after Perry finished working we had a Labor Day picnic. Yes I know it was a day early but Gabe and Dee have to leave early today and Perry works all day. So we had Grandpa Graffius, Mama, Papa, Mom, Dad, Gabe, Dee, Pastor Paul, and Linda for dinner on the deck. We saw deer as we ate and Perry did the grilling. I am so spoiled everyone brought something so there was little to do thanks to everyone. I however can not count and we had to bring out another table. There were eventually seats for everyone. You look beautiful in the dress! What fun! !